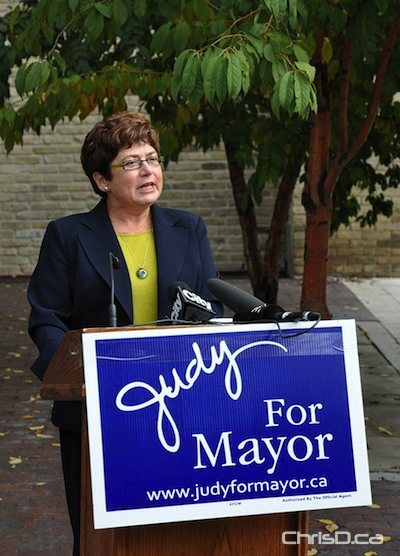 Judy Wasylycia-Leis revealed a number of green initiatives Friday, part of her campaign platform to oust Mayor Sam Katz in the upcoming civic election. Speaking to reporters in front of the Red River College Princess Street campus, Wasylycia-Leis vowed to finish Phase 1 of rapid transit and begin Phase 2, connecting the line to the University of Manitoba by 2014. The first line of a high-speed, climate-controlled, Wi-Fi-equipped bus rapid transit system would be built and operational within Wasylycia-Leis’ first mandate as mayor. The former NDP MP also pledged to reestablish an independent Civic Environment Committee to integrate and update the city’s three key environmental action documents (A Sustainable Winnipeg; Embracing Sustainability; and the Our Winnipeg framework) to transform research and studies into a plan of implementation. Wasylycia-Leis also offered incentives for business owners to become bike-friendly — proposing a 50/50 cost-share program for businesses looking to install outdoor bike racks. Establishing a green microgrants program for local, community-driven green-neighbourhood initiatives, from community and rooftop gardens, alleyway greening and boulevard plantings was also proposed. A number of other green plans were rolled out, including stronger protection for Winnipeg’s urban forest, and a strategy to lower carbon emissions by creating a Local Food Policy Council to engage local producers and community organizations already working on local food issues to leverage Winnipeg’s strategic position as a capital city in an agricultural heartland.